It has been a while since I have looked at VR, but I have decided to take a look at the Dell Mixed Reality unit. One of the best Mixed reality headsets amongst the competition. So you have to think back to the early 1990’s when I first tried out virtual reality. This was something back then that was space aged. The best you could hope for around this time in a PC would be a 486, or a Pentium. To get to play VR back then you had to visit a place that had purchased a VR unit and potentially wait in a very long line because everyone wanted to get a go. You placed on your head an industrial sized VR helmet and stood in specially designed area. You then began to play the game which could only be described as not just disorientating, but very blocky as you can see from this game play example. Roll forward about 20 years after VR had been initially promised and you get devices like the HTC Vive and Oculus Rift. This brought VR into the homes for the first time and people could not wait to get their hands on a version. These systems when initially launched cost well over £500 and more importantly needed a colossally spec’d PC to run them. Not only that these headsets run on a form of tracking called outside in. This uses satellites around your living room to track your movements to translate them into the games. This works well once set up, but with each satellites requiring its own power source can become difficult to setup. Wires can be run around rooms and makes it a wiring hell once again. Although I have seen these VR systems run on lower spec’d PC’s they can kick the hell out of your graphics cards. Roll forward and mixed reality headsets are launched that integrate well with windows. These are what I believe what will make Virtual Reality become accessible to everyone. Everything other than the graphics card has been in use for over 5 years. When I bench mark my PC for VR using steams VR Benchmark then my system fails in every requirement. Even with the addition of the GTX 1050. I recently had the chance to purchase my own version of Mixed reality headset from dell. After doing the necessary research I found out that people who have tested multiple of these headsets have found Dell’s to be the nicest and does feel allot like the Playstation’s VR offering when I placed it on my head. The two controllers although have a slight plastic feel to them are good enough to use and have a thumb stick and a touch pad. They have a similar look to the HTC Vive’s controllers. Unlike the previously mentioned outside in tracking these headsets run on a tracking called inside-out. This requires no satellites to be set up for tracking because it is all done from within the headset. This headset cost me £250 because I managed to pick it up second hand box unopened and buying new can cost upwards of £400. The Dell visor has just 3 wires coming off them a USB 3 and 1 HDMI cable. You can even plug in an audio jack into headset directly although earbuds might be a better option due to the headsets halo that goes around your head. All I had to do to set the VR unit in is plug one end into a spare HDMI port and another into a spare USB 3 port. Windows 10 then detects it and does the rest. As a person who suffers from mobility issues the windows VR house is very intuitive and has an easy way to get around. 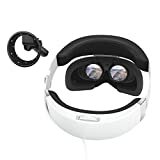 You can select VR games and films from the Microsoft App store, but more importantly these headsets are compatible with both Steams VR library and Oculus’s library. Giving you access to over 1000’s of VR titles. Amazingly though is the game play because of the issues I have mentioned before I held little to no hope of being able to run any VR game. I am pleased to report that not only could it handle the game play it ran the games very well. There are little focusing issues that can be sorted out by making sure that you have the headset on and adjusted properly. Other than that there have been no complications with the headset. The only draw back from one of these headsets is the length of the cable running to and from the headset which at 3 meters isn’t very long. The controllers themselves also run on batteries that unless you buy rechargeable, or very good batteries you only get 4-5 hours of game play. However, if you purchased 2 sets of rechargeable batteries then this would be solved. This would also be cheaper than buying in bulk non-rechargeable batteries. It would be nicer to have a USB recharging option for the batteries and could see them implement this into a docking station later if enough units sell. The Dell mixed reality unit is the better unit and offers a resolution of 1440 x 1440 per eye and a 90 Hz refresh rate. This is better than the resolution offered by the current more expensive models. Although you can see imperfections in some respects this could be down to my PC’s power rather than the unit itself. All in I am hugely surprised at this mixed reality unit offering by dell. As my first venture into the world of VR since the 90’s this is a cheaper alternative than the bigger established competition. It also offers little to no draw backs to your gaming experience. I would recommend this unit to anyone with an interest in VR. For a more detailed look at the Dell Mixed Reality headset take a look at it here.